You've heard it's happening... it's coming and it's going to be big! DANCE ACID RAVE a solo show by RYCA is opening next Thursday at BSMT. 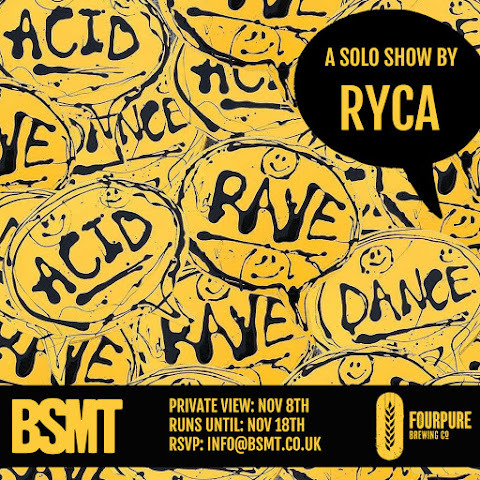 Ryan Callanan, (aka RYCA), is an Essex based artist who is well-known in the Street and modern Pop Art worlds. Using his experience in 3D work and traditional painting techniques RYCA playfully cross references by taking one item out of its context and splicing it with another to create something that feels familiar but whose meaning is subtly shifted. Older generations will recognise these references from their childhood and youth while for the newer enthusiast, his is a journey back in time to the heyday of plastic toys with a new found collectibility. Expect live djs, acid artwork, Star Wars themed works, the usual good stuff.... ALSO A FREE SILKSCREEN PRINT FOR THE FIRST 50 people! Over 200 works especially made for the show. Drinks courtesy of our good friends at Fourpure. The exhibition will run from Nov 9th to Nov 18th, with the private view on November 8th 6pm. The gallery is open Tue-Sat 11-6 and Sun 11-5. 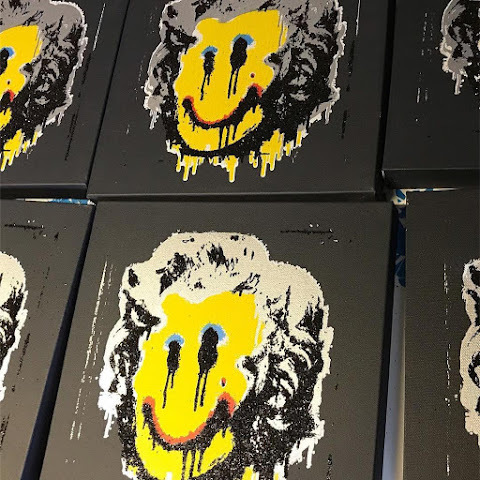 Banksy - Shredding the Girl and Balloon - The Director’s half cut. 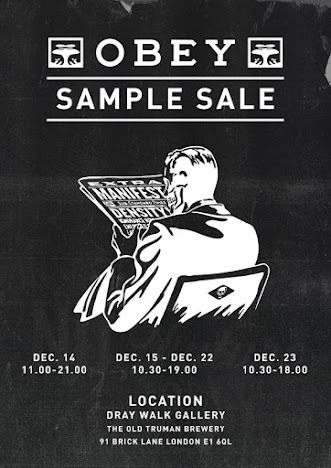 This week Obey Clothing are rolling into London’s East End for another show stopping Sample Sale; from tees to jackets and from caps to bags they will be representing their Men’s and Women's Collections and sprinkling through new exclusive styles at marked down prices. From their opening on Thursday 14th December up until the eve of Saturday 23rd they’ll be restocking and re-upping the selection of clothing available; they’ll be keeping the whole shop fresh whilst littering the rails with exclusive samples and classic vintage cuts. They’ll be in our usual spot on Brick Lane in the Old Truman Brewery so whether you’re just picking up a new tee for a present or restocking your whole wardrobe pop down and come say hello to the Obey Clothing team! 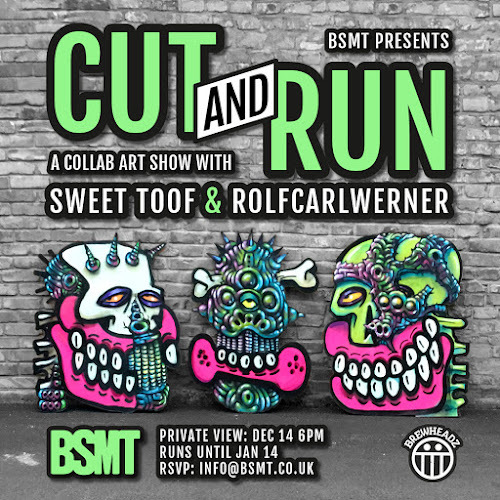 BSMT SPACE is closing off 2017 with a one of a kind collab show combining the futuristic styles of Swedish writer Rolfcarlwerner with the gums and teeth of Hackney's finest graffoholic Sweet Toof. The basement gallery will be clad with cut-out forms from life size Skull Humanoids to cans and hi-rollers, as well as a multivariate of beautiful objects created by the artists individually. 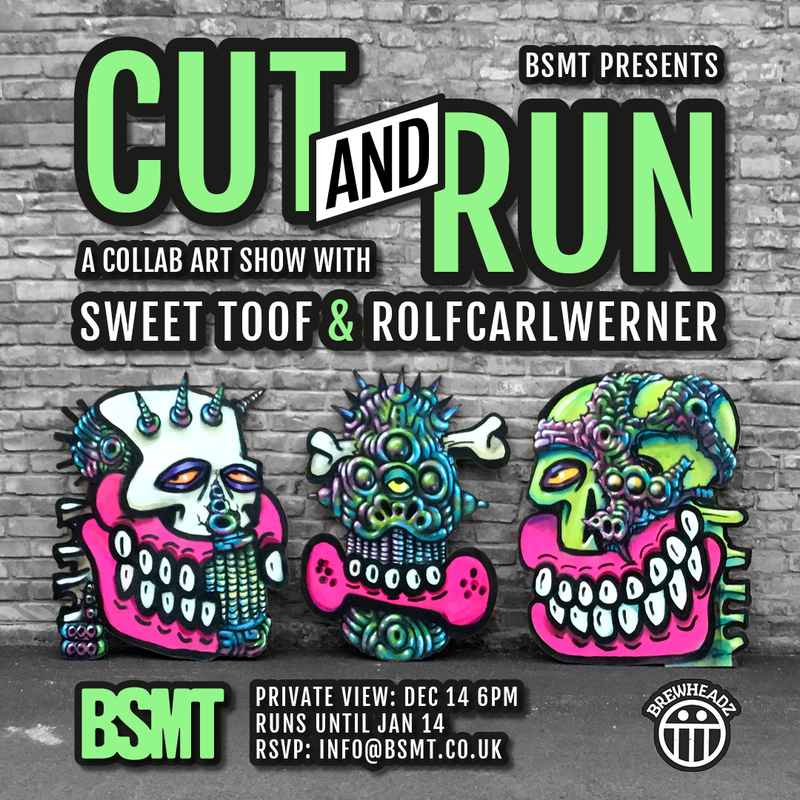 'CUT AND RUN' will be welcoming Sweet Toof back to Hackney- one of it's long-time and most recognisable Street Artists who's work has remained consistently synonymous with the industrial yards and canal sides of the borough during the past 15 years. We'll also be introducing London to old-school Swedish Graffiti writer and painter Rolfcarlwerner, a self-taught artist who has been painting since the 80's. He has been involved in public art commissions and exhibitions in Sweden for years and is widely known for his colourful, futuristic imagery. No catalogues, no previews- you've got to get yourself there on the opening night of December 14th if you'd like to see it first! You'll also be treated to the sheer pleasure of Brewheadz, Tottenham's finest micro-brewery, who are sponsoring the opening night! CUT AND RUN will open Dec 14th, 6pm and run until Dec 23rd 7pm. The gallery will reopen in the New Year on Jan 3rd with the show closing on Jan 14th. 12 artists from 10 countries spanning 4 continents will descend upon Stavanger in Norway once again this August for the 17th edition of the world’s leading street art festival NuArt. Site-specific murals, installations, interventions, and temporary exhibitions will be supplemented by Nuart Plus - the festival’s satellite program of academic and industry debates, artist presentations, film screenings, workshops, guided tours and more. The festival runs from Thursday 31 August to Sunday 3 September 2017. Check out the promo video for the festival below. 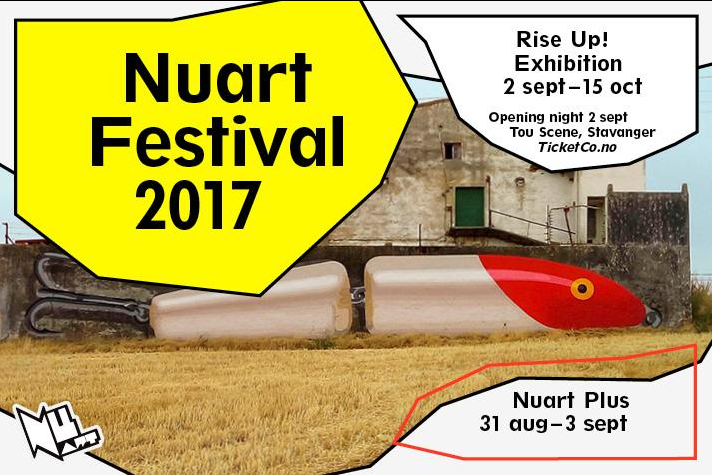 The grand opening of this year's Nuart Festival will take place on Saturday 2nd September at 19:00 at Tou Scene Centre for Contemporary Arts. The exhibition will then run from the 3rd September - 15th October 2017. 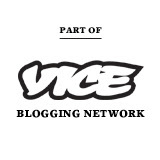 Location: Tou Scene Beer Halls, Kvitsøygata 25, 4014 Stavanger, Norway.